Probably not godliness, but who cares? Confession: I am a messy person. (Stop laughing, Molly.) I always have been. Although I know where things are when I want them, generally, I live in what looks to organized people, as a state of chaos. If you’re one of those hyper-organized people, brace yourself. I’m about to post a photo of my desk. Well, part of my desk. On this I rest my case. But now I’m my own boss. It’s working for me. Mostly. So I’m not about to change and am trying, really hard, not to beat myself up for it. What about you? Messy or neatnik? That looks JUST like my desk, Maureen!! I have to clear it out once in a while…you know, when the pile in front of the monitor starts to obstruct the view. Shannon and Sara, I knew we were kindred spirits. Yeah! One of my people! My desk could be interchanged with yours. and we would not know the difference. Lovely thing about chaos is, the chaos maker always knows exactly where everything is at any given moment. This may be the brilliance thing Einstein was talking about. I am messy, messy, messy, messy. That’s nothing Maureen. Fortunately in my day time job my boss is even messier than I am, so our unorganized chaos works for us. When my husband tidies I loose things … if he would just leave it in the pile I had left I would know where it was. I’m messy when I’m in the groove. 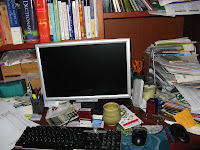 When I am procrastinating- I am VERY tidy. I have this love for organizatonal tools (folders, boxes etc) It never works, but I love the idea. I was so heartened the first time I saw this. I’m messy, which is why I think my husband hasn’t built my desk yet in the office. I’m a nomadic writer right now, traveling from the couch to the table to the bedroom. But it forces me to be clean.